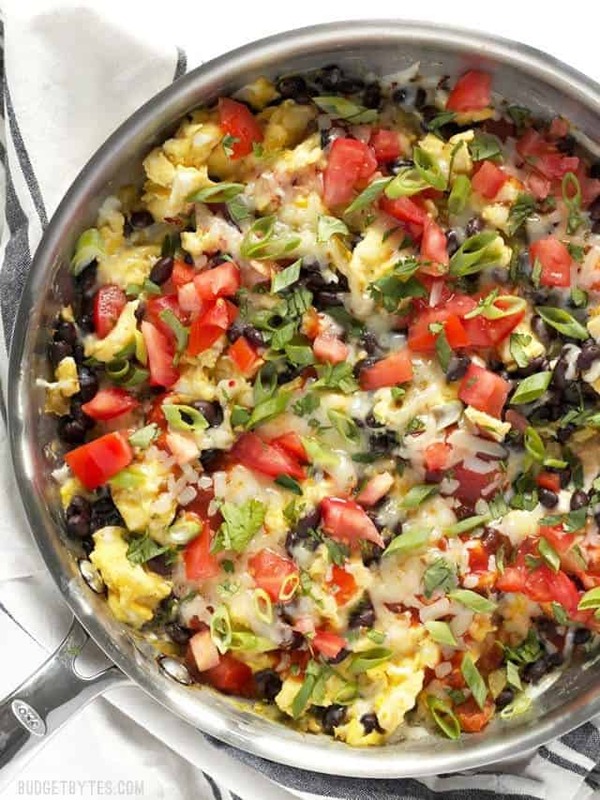 Scramble eggs make a great last minute, sweep-the-kitchen weekend brunch or dinner. As I was looking through my pantry and fridge taking note of what needed to be used up today, I noticed I had half a jar of taco sauce, a small can of diced green chiles, and a whole block of pepper jack cheese. 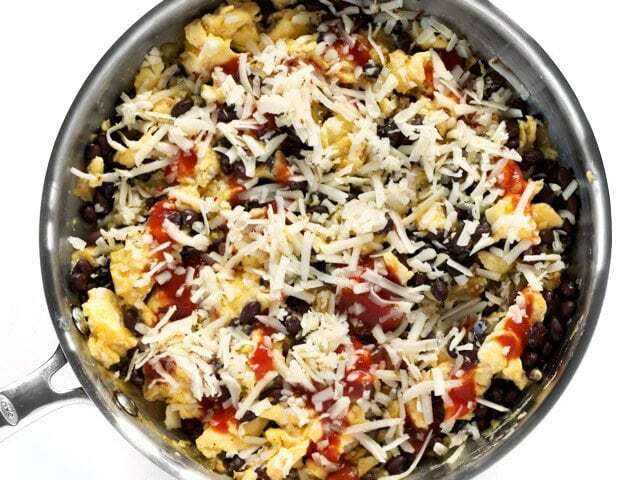 I knew immediately that I wanted a cheesy skillet full of Ultimate Southwest Scrambled Eggs for lunch. 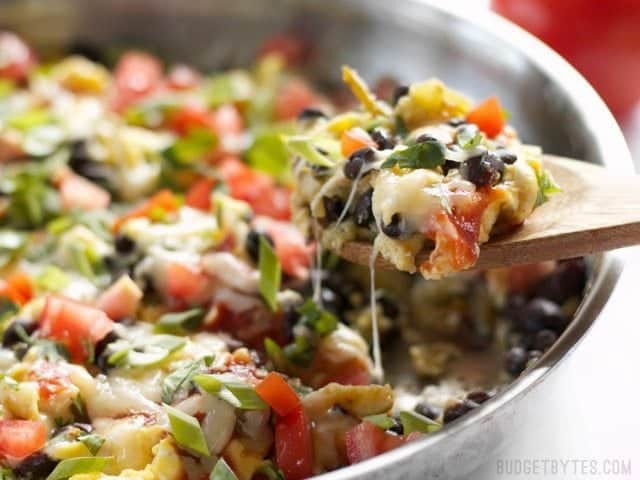 It’s like loaded nachos, except all egg and no nacho. LOL. As a devout egg lover, I’m not sad about that. 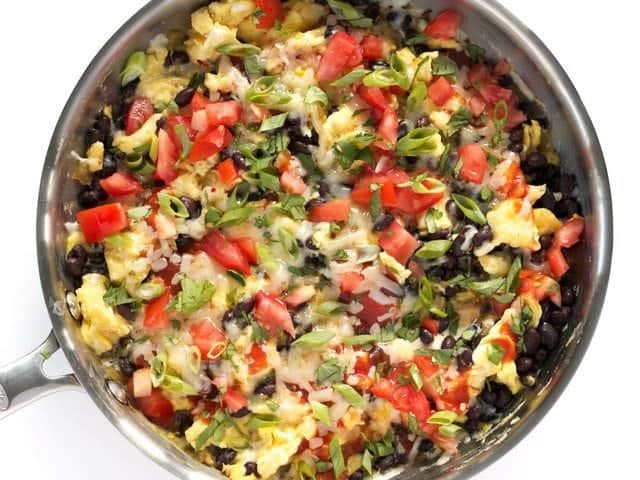 These “loaded” scrambled eggs also make a great base for breakfast tacos, breakfast burritos, or even breakfast quesadillas. Got leftover tortilla chips? Break them up and toss them right in the skillet with the cheesy eggs for a crunchy finish. When avocados are in season and less than a dollar each, dice them up and add them to the party. 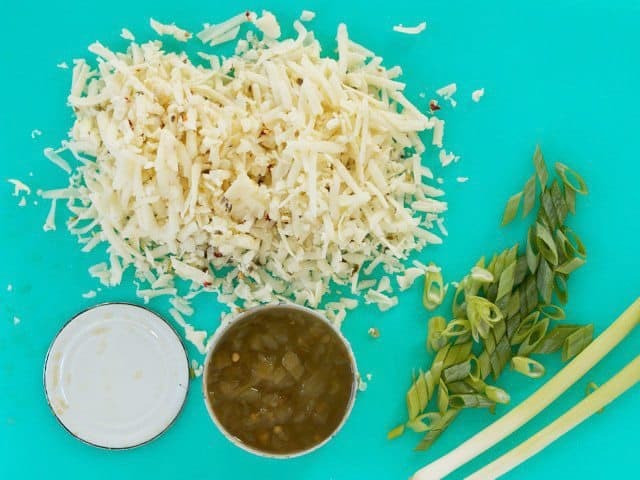 Salsa can be used in place of the taco sauce (although it can make the mix a bit more watery), or if you have any leftover homemade enchilada sauce, you can use that. If you’re a meat-manditory person, you can brown some breakfast sausage, ground beef, or bacon in the skillet before cooking the eggs (remove the meat first, then stir it back in later), or simply add some shredded rotisserie chicken. See how many options there are? SWEEP THE KITCHEN. 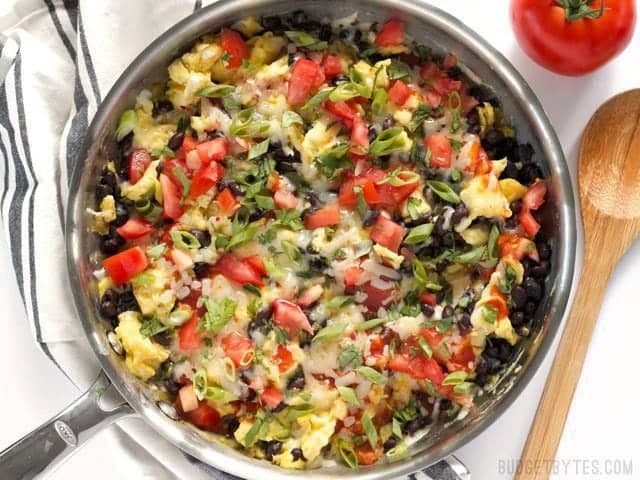 Ultimate Southwest Scrambled Eggs make a fast and filling dinner or brunch, and are a great way to use up leftover ingredients in the kitchen. Rinse the can of beans in a colander and let drain as you prepare the eggs. In a large bowl, combine the eggs, milk, a pinch of salt, and pepper. Whisk until fairly smooth. Heat a large skillet over medium-low heat. Once hot, add the butter and let it melt. Spread the butter over the surface of the skillet with a spatula. Pour the whisked eggs into the skillet and gently fold them with the spatula as they begin to set. Avoid over stirring the eggs. When the eggs are bout 75% set (still soft, moist, and fluid around the edges), add the drained beans and chopped green chiles (no need to drain the chiles). 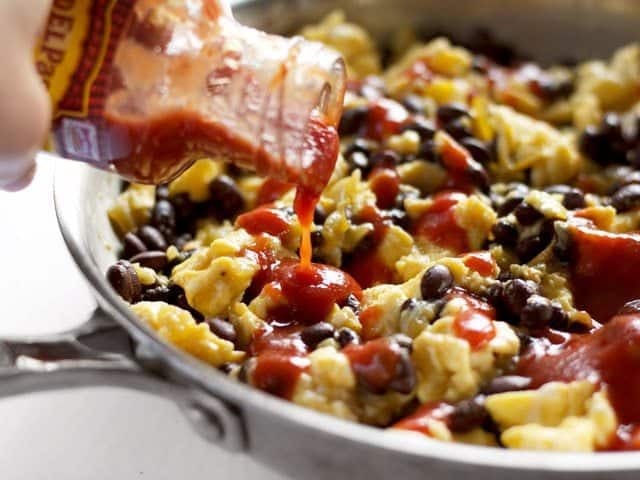 Gently fold the beans and chiles into the scrambled eggs. Drizzle taco sauce over the eggs, then top with pepper jack. Place a lid on the skillet and let it warm for about 5 more minutes, or until the eggs are fully set and the cheese on top is melted. While the eggs are warming through, slice the green onions and dice the tomato. Top the eggs with the fresh tomato and green onion just before serving. Eggs cook quickly, so I like to prepare my ingredients ahead of time. Rinse and drain a 15oz. can of black beans (those are in my sink, so not pictured). Open a 4oz. can of diced green chiles. Shred 4oz. pepper jack cheese, slice two green onions, and dice one small tomato (I actually diced the tomato as the skillet was warming later, but it’s never a bad idea to do it ahead of time). 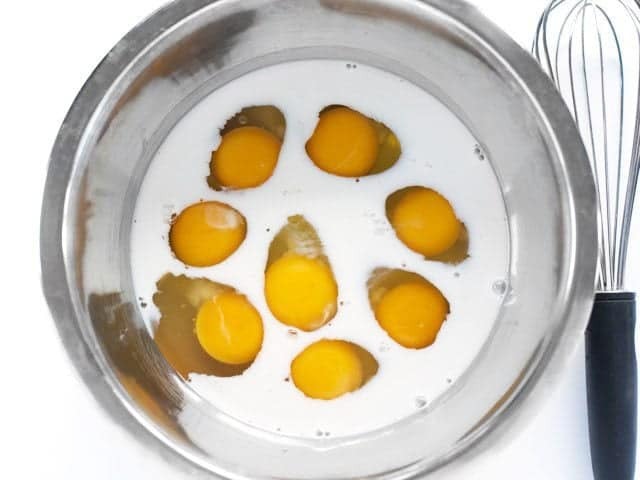 Add 8 large eggs to a large bowl, along with 1/4 cup milk and a pinch of salt and pepper. Whisk until fairly smooth. My personal preference is to not whisk the bejeezus out of the eggs, so there are still ribbons of white and yellow in the final scrambled eggs. I prefer to cook my scrambled eggs over medium-low heat so that I have better control over how fast they cook. 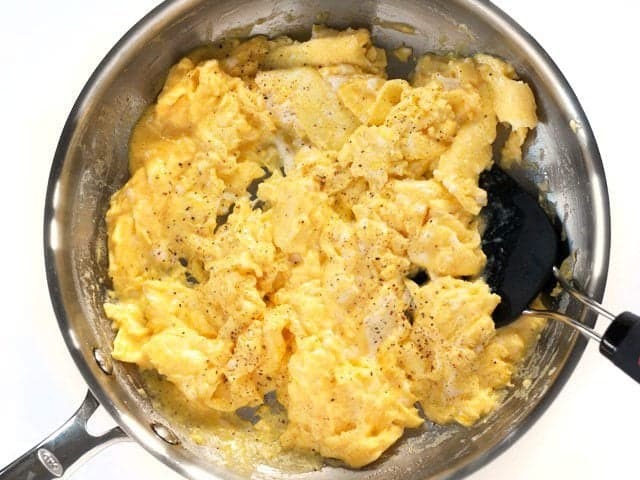 The biggest mistake people make with scrambled eggs is over cooking and over stirring them until they are dry, flakey, and in tiny pieces. To avoid that, heat a large skillet over a medium-low flame. Add a tablespoon of butter and let it melt in the skillet. Spread the butter over the entire surface of the skillet. 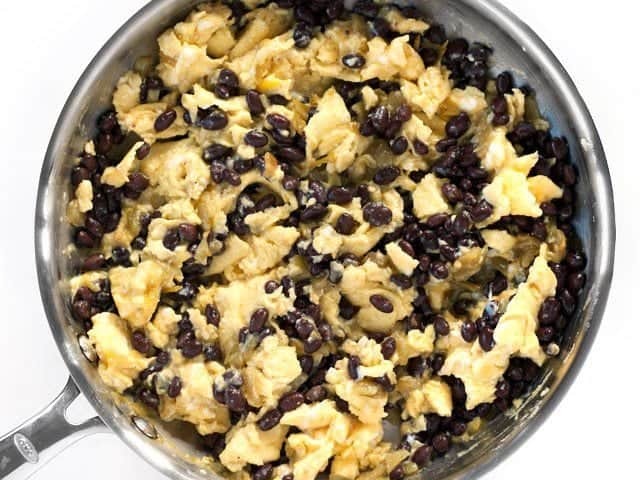 Pour in the eggs, then gently fold the mixture as it begins to set on the bottom. Don’t move the eggs around excessively, just push them around occasionally as the bottom layer solidifies. When they’re about 75% set, then it’s time to start adding in the other ingredients (the eggs will continue to cook, don’t worry). Add the drained black beans and a 4oz. can of diced green chiles. Gently fold them into the eggs. If you stir too much, everything will get pasty and gross, so just gently fold to maintain the nice large pieces of egg. Add 4oz. shredded pepper jack cheese, then place a lid on the skillet. Keep the eggs over the medium-low flame to let them heat through and to melt the cheese (about 5 minutes). Once the eggs have set and the cheese has melted, top with the diced tomato and sliced green onion. 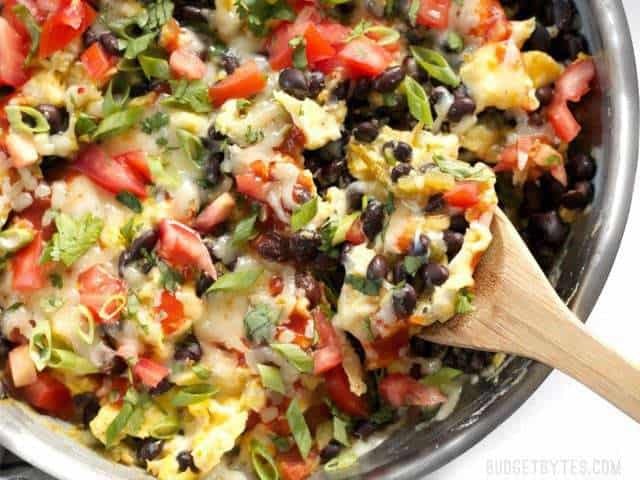 Then enjoy the cheesy goodness that is the Ultimate Southwest Scrambled Eggs. Simple and delicious. 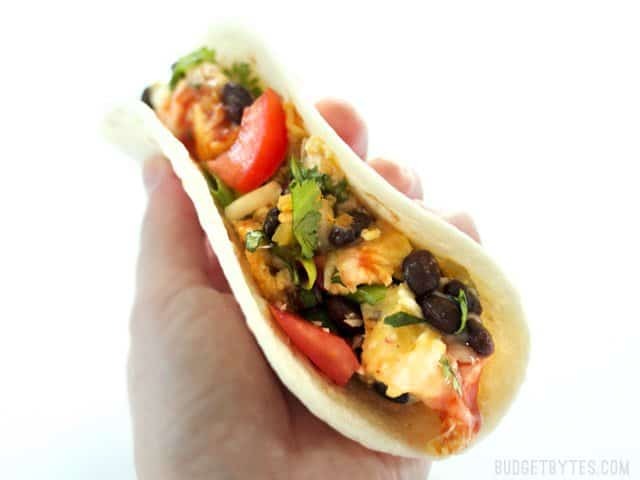 Reheated in the microwave amazingly well for breakfasts for the work week, with no noticeable change in texture. My family loves this…. it reminds my wife of a “mexican pizza” from Taco Bell! It is perfect for a quick weeknight meal. I have made this recipe several times, exactly as listed, it is a “regular” in the recipe book. Beth, thanks so much for all of your delicious recipes. I have had more success with your recipes for my family than with any other resource. What would you suggest as an alternative to green chiles? I have one family member whose stomach doesn’t tolerate them. Thank you! I’d probably just leave them out. :) There is enough going on with the other ingredients that it will still be tasty! My son and I absolutely loved this. We took out the tomatoes and added spicy sausage. Yum! I think we might add some crispy home fries to it next time. I made this the other day and it was delicious! I couldn’t poach the eggs so I just made sunny side up and I also added a little mustard to the sauce for more flavor. Thank you for the recipe. Yummy! Tasty! I added a dollop of sour cream and some Cholula for extra heat. Best breakfast dish ever! Thank you so much. Hi Beth, I love love this recipe. Even though it’s just sweetie and me I make the whole recipe. Then use it to stuff a burrito that I grill on my grill pan. We share one for breakfast or lunch with some fruit. Also I just want to thank you for sticking to your blog format and NOT cluttering it up with a bunch of crazy adds. I love your recipes. They inspire me. Thanks! All of your recipes look really good and not hard to make.